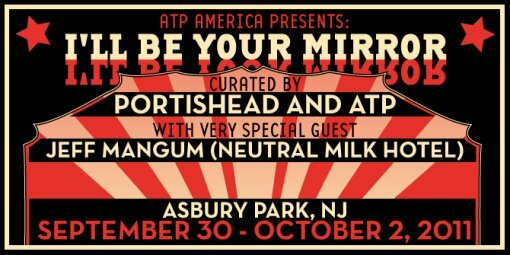 All Tomorrow’s Parties returns to the USA this September in the new location of Asbury Park, N.J. bringing an I’ll Be Your Mirror event to the iconic Asbury Park waterfront. For the inaugural American I’ll Be Your Mirror, Portishead will curate the Saturday and Sunday and headline their first East Coast shows since 1998! Since returning with their acclaimed Third album in 2008, Portishead have proven to be one of the most exciting live bands around and their long awaited return to the Tri-State Area will no doubt be one of the highlights of the year. ATP, who are curating on the Friday are also very excited to be able to present Jeff Mangum who on the Friday night will perform his first large public show of Neutral Milk Hotel songs in over a decade. After releasing what is now one of the most loved albums of the 1990s (In The Aeroplane Over The Sea), the group disbanded before many of those who now love their albums had a chance to see the songs performed live, so this will no doubt be a very special occasion. Please note, as Jeff has chosen to play in the stunning, but smaller Paramount theatre only people who buy 3 day festival passes get access to this show on Friday night. Also playing on the Friday are Chavez, Shellac, Cults and The Album Leaf, with a headliner and some comedians to be confirmed. The rest of the line-ups for the Saturday and Sunday will be announced in the near future. Also confirmed for headlining Friday night, but not mentioned in this press release is Bonnie Prince Billy (whose set will not conflict with Jeff Mangum’s show). Read the rest of the ATPNJ press release after the jump. I’ll Be Your Mirror is a new series of artist curated music, film and art events. Acting as sister events to the ATP Festivals, which take place in holiday resorts, I’ll Be Your Mirror retains the curatorial and multiple band and film concept, but will take place in cities worldwide. The events are named after the b-side to The Velvet Underground’s original All Tomorrow’s Parties 7″ single, released in 1966. Everyone who came to our three events at Kutshers knows how special the place was and how lucky they were to have been a part of our events there and while we are sad to not be returning, we are excited to be moving to the iconic Asbury Park. The Convention Hall has seen the likes of Black Sabbath, Led Zeppelin, The Doors, The Beach Boys and The Rolling Stones grace its stage and the Paramount Theatre has welcomed stars such as Tony Bennett who often insists on playing a song with all the electrics turned off to demonstrate the amazing acoustics of the room. We will be transporting the whole ATP experience over to this new location on the beach at Asbury Park, with the main shows taking place at the Convention Hall and Paramount Theatre, as well as the nearby Asbury Lanes and the Berkeley hotel, which the man in black, Johnny Cash himself once lived at. We think it will make a stunning successor to Kutshers. As well as the live music line-up of over 30 acts across the weekend, Friday will feature a Comedy stage, and we’re very pleased to announce that our friends at Criterion will return again to run the Cinema across the weekend. All three days will also feature DJs and other activities to be confirmed in the months ahead – we’ll also be bringing back some of our popular food vendors including the much loved Asia Dogs, and much, much more. Performances all take place indoors, so you have no need to fear about the weather! Friday Day Passes are $60 – they do not include the Jeff Mangum show in the Paramount but include everything else on that day. Friday day passes do not include Jeff Mangum’s show as explained above. Jeff Mangum will play a separate solo headline show on the Monday night, tickets for which are $35. Friday will also feature a Comedy Stage. The See Tickets go on sale at 2pm GMT, which is 9am EST. Thanks Ben, I thought that time might be off.